This 13-watt compact fluroescent quad lamp from Espen Technology has 4 pins and a G24q-1 base. 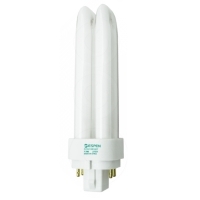 By producing 900 lumens, it creates the same quality of light as a 60-watt incandescent bulb. This lamp lasts an average of 12,000 hours, reducing the need for frequent replacement. It has a color temperature of 2700 degrees Kelvin, which produces a warm white color.